Radishes are a low GI food so they can help to stabilise your blood sugar levels, fill you up and provide you with slow release energy. This is because low GI foods cause a slow and gradual rise in blood glucose level rather than the quick and sharp rises caused by high GI foods. As a result, low GI foods can help you lose weight and help to keep blood glucose levels steady, which is especially important in diabetes. Many weight reducing diets, especially faddy diets, can be low in fibre or fruit and veg. A handful of radishes by your desk at work can contribute to your daily dose of fibre and help to curb those cravings. Just 8-10 radishes also make up one of your recommended five daily servings of fruit and vegetables (but remember, radishes can help slimming or weight control only as part of a calorie-controlled diet). If you follow the Weight Watchers plan, the good news is radishes are a zero ProPoints value food, meaning you can eat them until you feel satisfied. Remember though that portion control is an essential part of healthy weight loss and this points value is for plain vegetables so if you add butter or dips, you need to account for that. Radishes are full of vitamins and minerals including Vitamin C making them a beauty conscious girl’s best friend – if it’s gorgeous skin and a healthy body you’re after, get these pink beauties thrown into your beauty food regime quick sharp. Raw radishes are rich in a particular digestive enzyme called Diostase. So apart from the fact that you’ve already got fibre and fluid with other important minerals and vitamins rolled in, these crunchy vegetables can also help improve your digestive health. Radishes contain significant levels of the antioxidant vitamin C, which can protect the body from free radicals that may cause cancer; it’s also important for bone and muscles as well as your overall immune system. Women require folic acid (a B vitamin) when they are planning a pregnancy and during the first 12 weeks of pregnancy. Folic acid is crucial to the development of a baby’s spinal cord, so a good intake of folate is important to prevent spinal cord defects such as spina bifida. 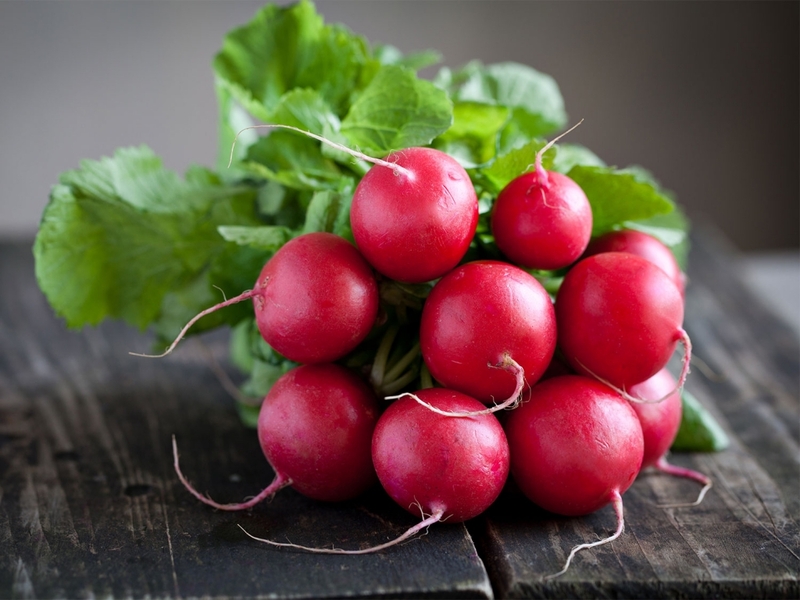 As a source of folic acid, radishes can help boost its level in the diet. Dark coloured fruits and vegetables can help to protect against some forms of cancer. Research from Ohio State University in 2007 suggests that radishes, grapes and other similarly coloured fruit and vegetables can be an effective treatment for colon cancer. The magic ingredient appears to be an antioxidant called anthocyanins which seems to stop the growth of colon cancer cells whilst not affecting healthy cells. Radish extract has been shown to be particularly effective in reducing the spread of stomach and breast cancer cells.